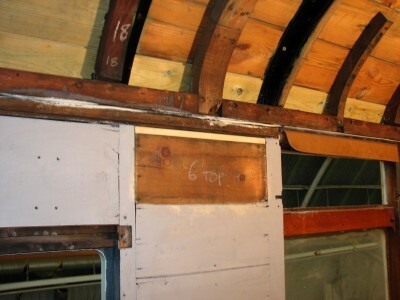 That should probably be ‘boxing-in day’ as the final pieces of tongue and groove boarding were fitted to 7828 at Rowsley. I’m not sure if boxing-in is the correct terminology, but it’s what we call the boarding that goes between the frame members on the inside of the coach. If you think it’s a bit rough you’d be right, it’s a support for the decorative interior panels and is never seen by the passenger so doesn’t have to look perfect, in fact a lot of the original boards are sawn but not planed. As far as the interior is concerned attention now turns to the ‘hoppers’ where the droplights live and once the rubber bump stops have been fitted in their new higher positions ( to prevent the droplights opening too far) we can think about replacing the long heater pipes. The latter are presently being rubbed down and painted ready for fitting – and they’re bloomin’ heavy!